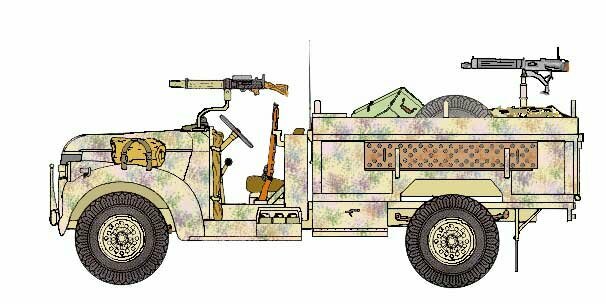 Every patrol commander had the authority to paint his vehicles as he felt best for the mission. 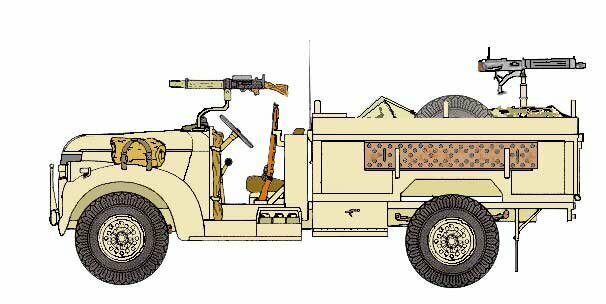 There was no standard pattern used by the LRDG for its vehicles. however there were quasi-standards within patrols. Patterns were based on the geography the patrol would operate, the time of day that was consider the most dangerous, and mission specific reasons. 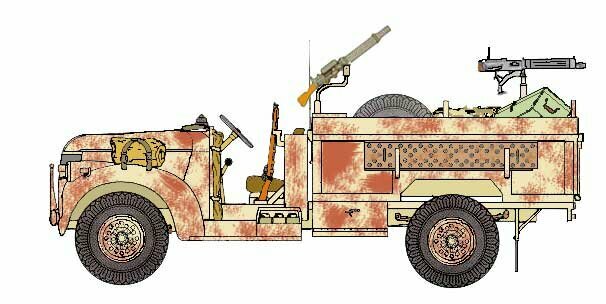 (Perhaps a vehicle would be painted in order to fool enemy aircraft in to thinking the vehicle was German or Italian). Because every patrol commander consider numerous factors several camouflage patterns existed. 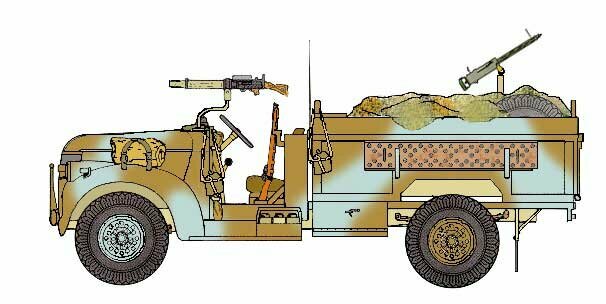 Unfortunately few colour photographs of the vehicles exist so we are left with personal recollection and conjecture to determine how vehicles were painted. 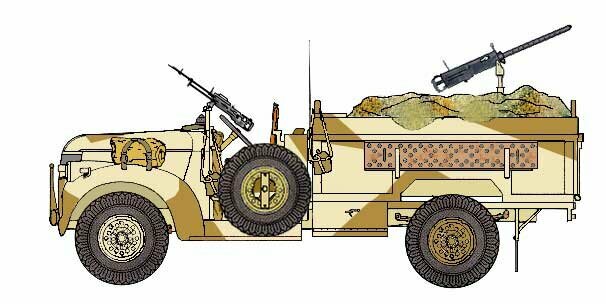 For this reason, it is best to consider the patterns below as nothing more then guidelines and not the "Gospel of LRDG camouflage". 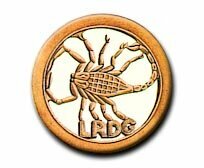 An excellent resource for paint schemes is Robin Jenners' book, The Long Range Desert Group, mentioned in the Sources. Canadian Sand, overall. As the patrol enters a coast region they encounter areas of rich red clay which cause the vehicle to stick out. In order to better blend in, they smear a mixture of oil and red clay over the body of the vehicle. Disruptive pattern of light sand and middle stone. 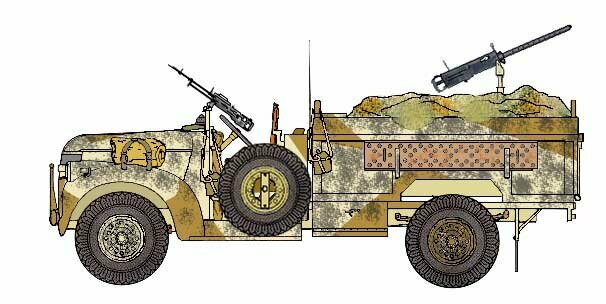 The disruptive pattern is designed to break up the outline of the vehicle. 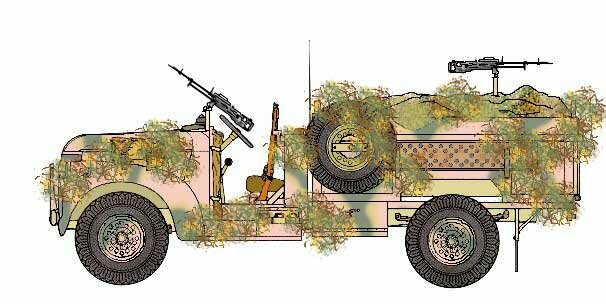 Note the camouflage net covers all the equipment in the bed of the truck. Desert Pink, overall. 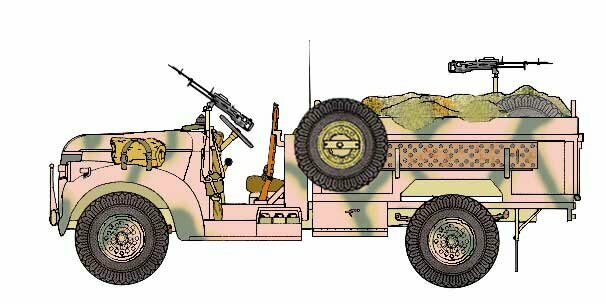 The pink color was thought the best color to hide the vehicles at the most dangerous times of the day (sunrise and sunset) and help the vehicle to disappear in the hazy horizon when seen at a distance. 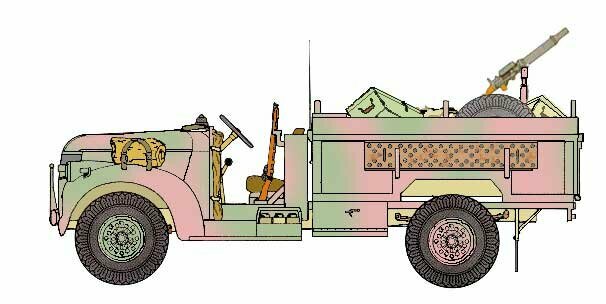 Chrichton-Stuart mentions that the vehicles of G Patrol in a rose pink (mauve) and olive. He referred to the pattern as startling. Light brown and azure.was another disruptive color pattern used the patrols. In this case the pattern is soft edged flowing lines. The idea would be for the vehicle to blend into the distant haze of the horizon. A base color of canadian sand with pastel stripes of pink, portland stone, azure and light olive. The pattern was used by T patrol and considered effective for blending the vehicle in the surroundings of the open desert. Desert pink with a wavy pattern of light sand lines which have been over sprayed in the middle with a medium olive color. The pattern is used to help break up the outline among the shrubs along the coastal region. Random splotches of purple, light green, light brown, desert pink, and azure of what was a base color of Canadian sand. Desert pink with a wavy pattern of light sand lines which have been over sprayed in the middle with a medium olive color. 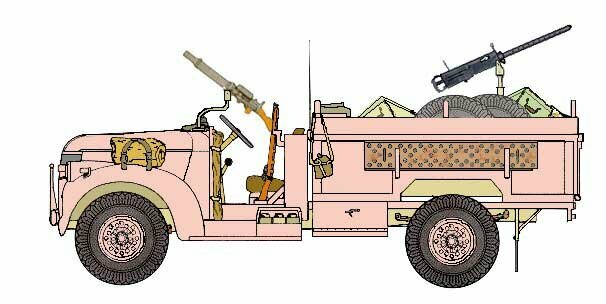 Local shrubs from the area have been added to break up the outline of the vehicle and better cover some of the large pink areas. Disruptive pattern of light sand and middle stone. As the patrol enters an new desert region with a black sand region, the light sand becomes conspicuous. The local black soil is mixed with oil and applied to the vehicle, especially in the sand colored areas.